We got our CSA selection today. Once again, it is very green. 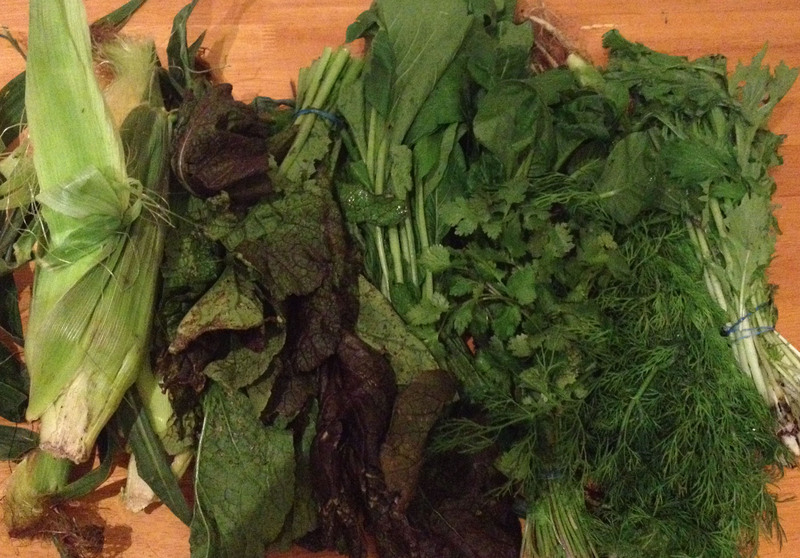 Our assortment contains 3 ears of corn, spinach, dill, red mustard greens, cilantro, taitsoi, and mizuna. It will be a challenge to use all of the greens before they wilt. I mean, how many types of dark leafy greens can one eat at a single sitting? Is there soup in my future once again? Stay tuned for this week’s adventures in farm fresh produce. 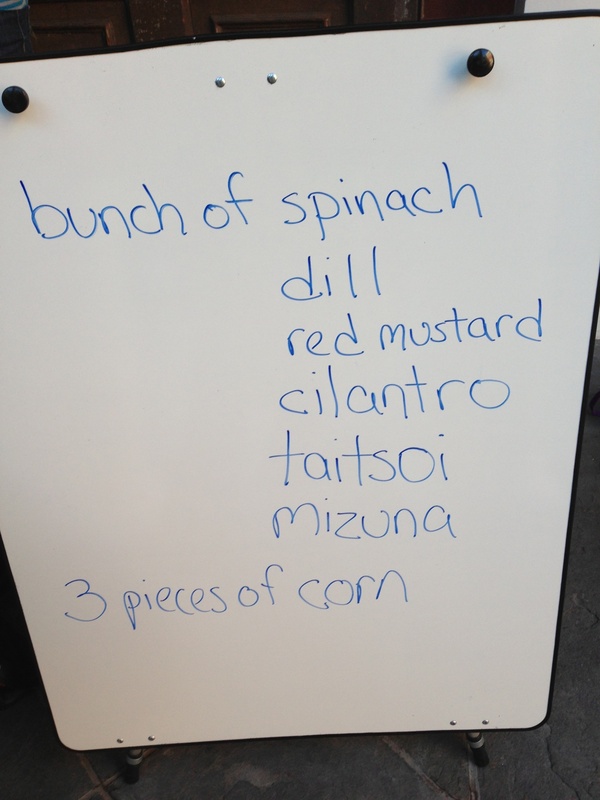 This entry was posted on October 11, 2012 at 6:49 am and is filed under Food. You can follow any responses to this entry through the RSS 2.0 feed. You can leave a response, or trackback from your own site. The great thing about the greens (or one great thing) is that a mass cooks down to nothing. so much green! Looks delish 🙂 Come and link up your lovely haul to this week’s link party when you get the chance…http://inherchucks.com/2012/10/10/whats-in-the-box-47/. Looking forward to seeing you there! I’ve enjoyed tat soi and mizuna in smoothies (the mustard is too peppery for my tastes) and even frozen them for future smoothie use. How could you put up the herbs (cuz I’m all about the putting up)? Do you have a dehydrator? For something cooked, freezing dill and cilantro would be fine. My challenge with greens is doing something with them before they are just done. Luckily this CSA (my 3rd) does put most of the greens washed in bags, so they tend to last a bit longer. The first CSA didn’t do a thing to them and if I didn’t get them washed, spun, and in a crisper on pick up day they were toast. Well, soggy slimey toast.